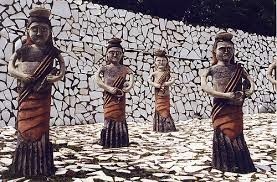 The rock garden or Rock Garden of Chandigarh is a Sculpture garden in Chandigarh, India, also known as Nek Chand's Rock Garden after its founder Nek Chand, a government official who started the garden secretly in his spare time in 1957. Today it is spread over an area of forty-acres (160,000 m²), it is completely built of industrial & home waste and thrown-away items.The garden is most famous for its sculptures made from recycled ceramic Waterfall at Rock Garden, Chandigarh. It is situated near Sukhna Lake.It consists of man-made interlinked waterfalls and many other sculptures that have been made of scrap & other kinds of wastes (bottles, glasses, bangles, tiles, ceramic pots, sinks, electrical waste, etc.) which are placed in walled paths.